(SWAINSBORO, GA) Savannah-based Enmarket is pleased to announce the opening of a new full-sized convenience store at 609 S. Main Street in Swainsboro. The 4,300-square-foot market features a variety of healthy and flavorful food options and provides 20 fueling positions that offer gasoline, diesel, off-road diesel and ethanol-free fuel. This is a modified version of a new prototype for Enmarket, which will debut in 2018. The store is a rebuild of an Enmark kiosk. Expansion to a full-size convenience store was made possible through the acquisition of an adjacent property. A wide selection of healthy “better-for-you” snacks, fresh fruit options, and a 28-degree beer cave with a wide selection of local craft beers are notable improvements to the former kiosk site. Customers and commuters will also enjoy the convenience of Enmarket’s proprietary food concept, the Eatery, which serves breakfast, lunch and dinner. Eatery customers can order from self-serve kiosks that help ensure order accuracy and speed of service by allowing the kitchen staff to focus on food quality and preparation. A large seating area allows customers to dine in. Menu favorites include hand-breaded fried chicken, fried fish and freshly made biscuits, along with grab-and-go salads, sandwiches, fruit cups and parfaits, which are all made fresh in the store’s kitchen. 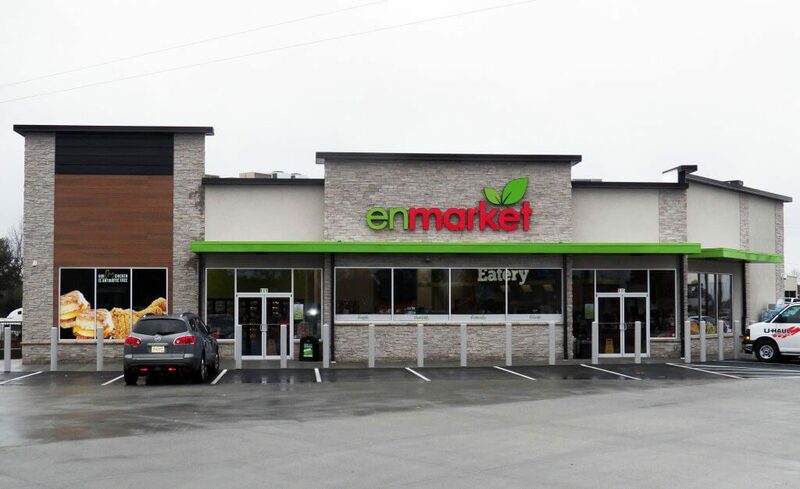 Inside and out, the property features the fresh, clean design elements associated with the Enmarket brand, which was re-imagined from the iconic Enmark brand in 2015 to reflect the company’s broader fresh food and health commitments as well as its expertise in driving the innovations needed to shape the future of the convenience store industry. Founded as Interstate Stations in 1963 by Robert Demere, Enmark Stations, Inc., which operates as Enmarket, is a family-run business committed to offering its customers top-notch service and superior products. Today, the Savannah-based company, which celebrated its 50-year anniversary in 2013, operates 90 stores in Georgia, South Carolina and North Carolina. Enmarket’s mission is to Enrich Life. Stores offer freshly prepared food and healthy snacks, high-quality double filtered gasoline, beverages, lottery services and more. Enmarket customers can save up to $.10 per gallon by using the company’s Cash Card, a reloadable stored-value card that can be used directly at the pump. Coupons, promotions and a location finder are available on the free Enmarket mobile app. For more information, please call 912-236-1331, visit www.enmarket.com, or visit one of Enmarket’s social media pages. Enmarket is a subsidiary of Savannah-based Colonial Group, Inc.